Image is in mapped colors, from the emission of ionized elements, R=Sulfur, G=Hydrogen and B=Oxygen. This combination is generally called to HST-palette. 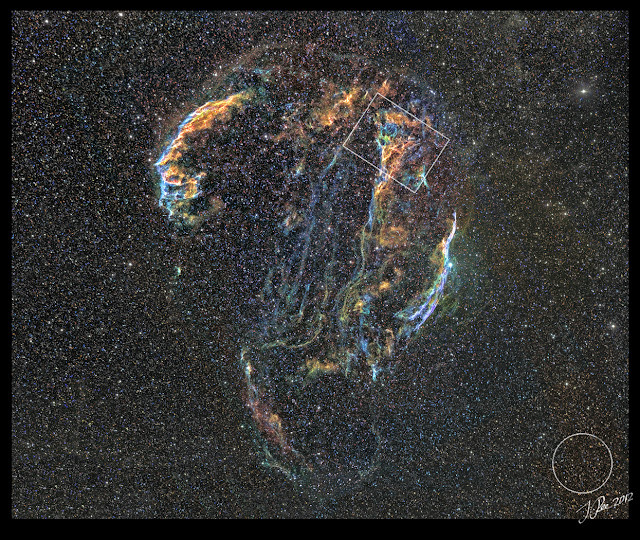 It's used originally by the Hubble Space Telescope. I managed to shoot enough data for the S-II channel, to build a three channel color image, last night. Pickering's Triangle, Simeis 3-188, is a small part of the Veil Nebula supernova remnant in constellation Cygnus. 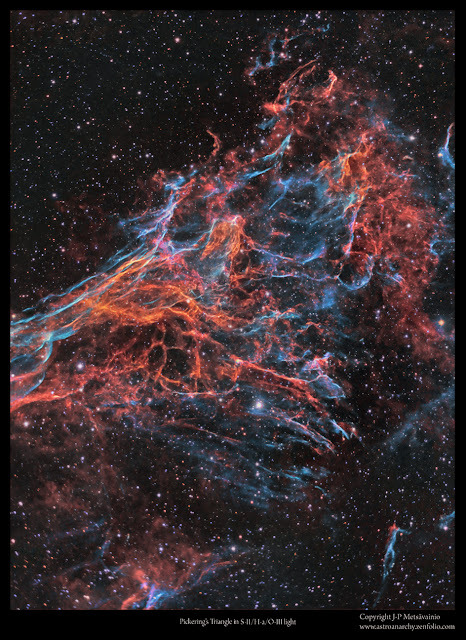 Veil Nebula is a cloud of ionized gas and dust, leftovers from an exploded star. The star went off some 5000-8000 years ago at distance of about 1470 light years. This, relatively faint target, is difficult to image due to the large angular diameter, about three degrees, and a dense star field. Area of interest is marked as a white rectangle, the apparent size of the Moon can be seen at lower right corner. R=Hydrogen + Sulfur, G=Oxygen and B=Oxygen + Hydrogen. 4x1200s exposures for the S-II, emission of ionized Sulfur = 1h 20min. Sometimes I'm publishing starless versions of my images. The actual nebula stands out better by this way, since human brains has a habit to form false shapes from a group of random dots, like stars.